Do you compare your feet to an old lady’s foot? Are your toes becoming crooked and twisted? Do you notice where your toes hit the top of the shoes? Are you having trouble fitting your feet into your shoes? Are you growing painful areas of hard skin on the top of or in between your toes? You likely are suffering from a very common foot deformity known as hammertoes. 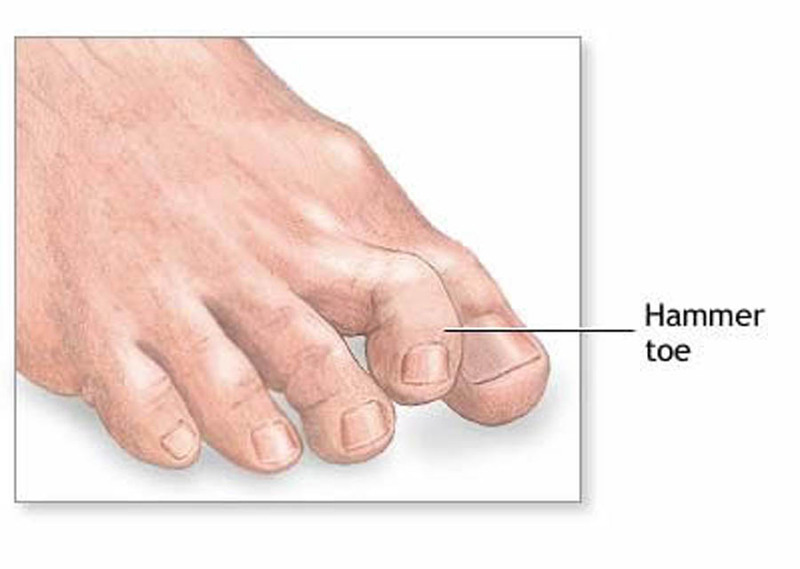 A hammertoe is a contracture of one or both joints of the second, third, fourth, or fifth toes. This abnormal bending can put pressure on the toe when wearing shoes, causing problems to develop. Common symptoms of hammertoes include pain or irritation of the toe, formation of corns on the top or sides of the toe, and calluses on the bottom of the toe or on the ball of the foot. The most common cause of hammertoe is a muscle and tendon imbalance. This imbalance, which leads to a bending of the toe, results from mechanical (structural) changes in the foot that occur over time in some people. Hammertoes are often aggravated by shoes that don’t fit properly and, in some cases, ill-fitting shoes can actually cause the contracture that defines hammertoe. Treatment for hammertoes include trimming of painful corns and calluses, padding corns and calluses, changing shoegear, custom orthotic devices, injection therapy, medications, and splinting the toe. In some cases, usually when the hammertoe has become more rigid, surgery is needed to relieve the pain and discomfort caused by the deformity.